More than one million kilos of bananas, 1,189,343 kg to be precise, have been exported by Europlátano from the Canary Islands during 2018. It's been more than two years since Europlátano embarked on this adventure. "It is clear that starting is difficult; a great investment is required, not only of money, but also time; time to find out exactly what products are demanded by the European clients; time to adapt to their demands; time to train staff, and time to show our customers everything about Canary bananas, about their cultivation, their history and about the people who work with them," say sources from the company. "In addition to understanding our clients, we also want our clients to understand us and desire to get involved in the project at the same level as Europlátano. Both Switzerland and France decided to introduce Canary bananas after visiting La Palma, the farms and the packaging facilities." For the company, the shipment of over a million kilos entails growth by 46% compared to the previous year. "Our company has been making a great effort to bring the taste of the Canary Islands to European consumers. This has required the involvement of the entire company, from the farms to the points of sale, looking after the product and adhering to the quality standards demanded by European customers," say sources from Europlátano. "This fact makes our company proud, but it must also be taken into account in the sector, since almost 4% of the annual Canary production is discarded, presumably, to avoid saturating the peninsular market. Europlátano believes that the solution to prevent the Spanish market from becoming saturated is not to discard a given share of the production, but to properly organize the production based on the demand and adapt in order to seek out new markets," they say. 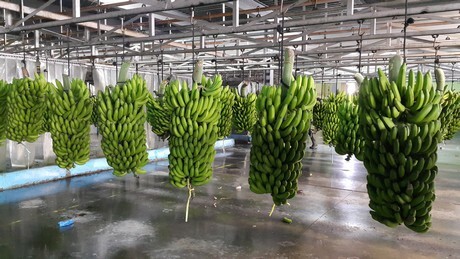 "After an atypical year, with imported bananas constantly gaining share in the peninsular market, we need to differentiate our product even more, working from the bottom up to obtain a banana with an unquestionable quality and taste. In fact, this is the fifth year in which our flagship brand, Gabaceras, has been given the Flavor of the Year 2019 label, which is awarded by consumers after blind tastings." "Lastly, we want to thank our partners in this European adventure, the Swiss chain Coop and the leading French organic product distributor Biocoop, for the trust placed in our team and in the project. We are also thankful for their collaboration in the product's differentiation on their shelves, bringing it closer to consumers. We started 2019 with this great news and we hope that, by working hard, we'll be able to add a new country to the list of European countries which already enjoy the Taste of the Canary Islands thanks to Europlátano," they conclude.